Used Land Rover Defender vehicles for sale from a Light Commercial Vehicle Dealer. 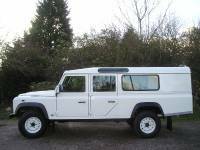 100 Miles, ANY, 2 door 4x4 2.5 Litre Diesel, Hand Built vehicles to YOUR spec. 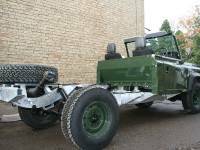 Price+VAT Green, 100 Miles, Currently in Build, New Galvanised chassis, Recon 300 Tdi Engine, Recon Gearbox, Rebuilt axles, New Radiator, New Tyres, New propshafts, Vinyl seats, cubby box, Fully built and painted in part form and then assembled with new bolts to a Foley High standard. ....Please call for details and completion dates...01279 793500 This can also be carried out with Td5 Recon Engines at similar cost. Can be built in ANY colour. This is the closest you will get to a New Land Rover!! 105000 Miles, Green , 3 door Four Wheel Drive 2.5 Litre Diesel, 130 Defender Gun Bus in build. Built onto a new galvanised Chassis. 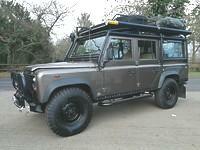 Being assembled with new suspension - new clutch kit - off road tyres and 10 seats in the rear with 2 upfront. New Galvanised chassis New suspension Over hauled axles Fully painted in Coniston Green 10 Seats in the rear 2 seats in the front with a cubby box Rear door entry with step Opening side windows Rubber mats to all floor areas Under seat storage Communications hatch between the driver and passengers New MOT Fully serviced £SOLD another in build We have made many of these vehicles and each one is bespoke - please feel free to call and discuss how we can build one for you.